Did you know that solar energy is no longer just for home or office? Solar energy is now available for a wide variety of portable purposes. If you love weekend camping trips, solar energy can save you valuable dollars on fuel. If your student and you depend on your tablet and phone while in class, then you could benefit from portable solar energy. Maybe you are a patient who depends on a medical device. Or a small business owner who depends on their phones and tablets each day at work. If you have any of the above needs, please read further to learn all about portable solar energy. If you have any questions, please feel free to contact our office toll free at 1-800-492-4061. Camper - Whether you are an RV'er, a camper, or you just enjoy a day of backpacking in California, portable solar equipment can keep you charged whether you were on the grid or not. Student - Taking advantage of the sun's power is more than just powering cell phones and tablets. Portable solar energy can provide you peace of mind in the classroom, in the library and even at home when you are cramming for that big test. Medical Device Patient - Are you a patient who is depended on a medical device such as a CPAP machine, oxygen tank or even an infusion pump? The portable solar energy now offers a wide variety of portable devices they can literally save lives. Including solar suitcases, portable solar analyst, solar chargers and solar kit's health is now at your fingertips. Traveler - Whether you are traveling from state to state or across the country travelers can use backpacks, portable solar panels and small chargers to keep their electronics operating consistently. Small Business Owner - Are you a small business owner or just someone who is constantly on the go? Portable solar can keep all of your devices, including tablets files and GPS systems ready when you need them. Construction/General Contractor - If you are a general contractor or construction worker, a solar generator will keep all of your power tools and appliances at top performance to keep your project running efficiently and effectively. Portable Personal Solar Panel Chargers - Did you know that according to a recent study by the Pew Research Center, approximately 64% of today's Americans own a smart phone? That number is huge especially for those on the go or those living off grid. Your solar panel charger allows you to not only charge your phone and check your e-mails but also charger cameras, GPS devices, 12 V batteries, wireless ear buds and many other mobile electronics. "Go solar today and never again do you have to worry about a dead battery." Portable Solar For Camping - Even though camping is supposed to be all about unplugging and getting away, smart camping still requires access to power. That's where portable solar comes into the picture. Portable solar allows you to leave your gas powered products behind and still camp in confidence that your generators, flashlights, stoves, and weather band radios, GPS systems, smart phones, lanterns and other cooking devices are powered up when you need them the most. At Wing Solar & Wood Energy, Inc. we realize that investing in a solar generator is a huge decision. In doing so we have included a list of 10 care tips to help ensure the life of your new generator. Do not expose solar generators to dust. Avoid water even if your solar generator is waterproof. Do not allow the generator to fall. Be sure to store the generator at half charge. When in storage, be sure to charge your generator at least every 3-6 months. When using your generator, be sure not to deplete the power more than 95%. Be sure to use only the suggested charging accessories. When replacing the battery, be sure to get the right one. Always protect your portable generator from extreme heat. Be sure to never overload your solar unit. At Wing Solar & Wood Energy, Inc.we believe saving the environment extends way beyond the home or the office. Alternative energy should be available both indoors and outdoors. 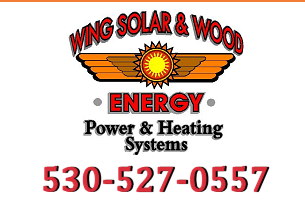 As your complete resource for all your alternative energy needs Wing Solar & Wood Energy, Inc. is here for any questions you may have.